What is cash out and should you use it in your betting strategy in 2019? Plus find out the best bookmakers that offer cash out features. 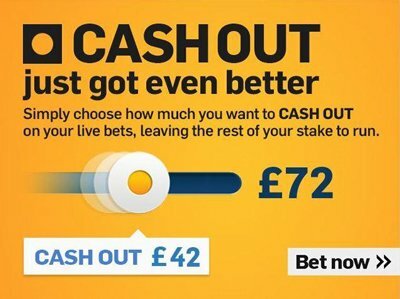 Cash out is a relatively new addition to the betting industry and it’s certainly a feature that punters across the UK have come to love over the last few years. But should you consider using this strategy to increase your earnings and which bookies offer the best cash out features in 2019? Read on to find out more. For those of you that are new to betting or haven’t heard of cash out before, this section is for you. As I mentioned above, cash out is a very popular feature amongst bettors. You can even use it to lock in a profit using matched betting, as we’ll look at below. But what is cash out? Cash out is a betting feature that allows punters to settle their bets before an event has finished. Traditional bets are settled after the final whistle and any winnings are consequently paid out. With cash out, bettors can choose when to settle their bets. This can be before an event starts or as the event takes place. Ultimately this gives the punter more control of their bets and allows them to lock in a profit before an event has finished. This is one of the main reasons cash out has become so popular over the last few years. It’s great for punters that are less risk-averse and happy to take a smaller profit rather than risk their bets. The bookies work out the value of the cash out using the current odds of the market you placed your bet on. You’ll often find your cash out options and the value in the my bets section of your account. Some bookmakers like Bet365 even offer an auto cash out feature that lets you set a rule for cashing out. You can automatically set your bets to cash out if they reach a certain profit. This is a cool feature for those that don’t want to sit and wait around. Betfair offer a feature that allows you to cash out part of your bet, letting the remaining amount run until the final whistle. Again, a nice feature from Betfair making cash out even more versatile. Which bookmakers offer cash out? So now you know a little more about cash out and why it’s so popular, let’s look at which bookmakers offer the feature and how they compare. In the modern world of online gambling, the competition is very fierce meaning the bookmakers are always looking for ways to improve their platform. As we’ve already seen, cash out is a popular feature that many punters expect when looking for a new bookmaker. For that reason most bookmakers offer some kind of cash out feature for their customers. Whilst the details of cash out may differ between bookmakers, most are quite similar. You may find that some bookmakers name their cash out feature differently. For example, Smarkets call their feature ‘Trade Out’ rather than ‘Cash Out’. However, they both mean the same thing and work similarly. Matched bettors are always on the lookout for great ways to increase their income from betting strategies in 2019. One of the methods you can use is the cash out feature offered by many online bookmakers and betting exchanges in 2019. This feature has a number of benefits for matched bettors which we’ll look at below. The first of which is that you can use this method to recover from any mistakes you may have made when placing your matched bets. If you’re quick to spot your mistakes, you can cash out your bets before the odds change too much. In this scenario you’re unlikely to lose much money and you can go back and place the correct bets. You can use this technique for both your back and lay bets. However, it’s far easier to use it on the latter as the calculations are much easier. If you’re unsure about back and lay betting, you can find out more in this article. Using cash out, you can also potentially lock in a guaranteed profit. To do this you’ll need to take advantage of a bookmaker promotion that pays out your winnings before an event has finished. Using this method, you can potentially make some great profit if results go your way. Promotions like Bet365’s Early Payout and Paddy Power’s 2 Up are the ones you’ll need to use. In these promotions, the bookmaker pay out your winnings if your selected team go ahead by a certain number of goals. For the Paddy Power 2 Up example, it’s 2 goals. In this scenario, the bookie will close your back bet and pay out your winnings. Your lay bet will still be open leaving you with a number of options. You can either close your lay bet and lock in a small profit or leave your lay bet open and hope your selected team go on to draw or lose the game. In this scenario both your bets would win leaving you with a great profit from your bets. So how do you actually lock in a profit using the cash out feature in matched betting? As with anything, it’s easiest to explain the process with an example. To make this process work, you’ll need to place both a back and a lay bet on the same market. You’ve noticed Bet365 are offering early payouts if Man Utd go ahead by 2 goals. So let’s say that you place a matched bet on Man Utd to beat Leicester City. If Man Utd go two goals up in this game, Bet365 will pay out your winnings before the final whistle. You could either close your lay bet and lock in a small profit or risk your luck and go for broke. If Leicester City go on to score two more goals and eventually draw the game, your lay bet would also win. The outcome would be the same if Leicester went on to win rather than draw. This would leave you with a great profit from your bets. Overall, these promotions are certainly a great way to profit from cash out features and you should definitely consider adding them to your 2019 matched betting strategy. Overall, cash out is a great feature that many bookmakers offer in 2019. It gives punters more control over their bets and it can help you recover from any mistakes in strategies such as matched betting. Cash out is a brilliant way to increase your betting profit and it’s certainly something I recommend you consider for 2019. What do you think of cash out? Let me know by leaving a comment below right now.